Computer numerical control (CNC) is the automated control of metalworking tools (drills, boring tools, lathes) that can create complicated parts by means of a computer. Generally, a CNC machine alters a blank piece of material (metal, plastic, wood, or ceramic) to meet precise specifications by following programmed instructions and without a physical operator. That said, High-performance Metal CNC machine means increased productivity and labor cost savings, which has a huge impact on corporate profitability. CNC metal working machine with cutter tool during metal detail milling at factory. Image source. Metal CNC machine consists of the bed, the column, the guide rail, the work table, the tool holder like ordinary machine tools. In order to match the high-precision and high-speed characteristics of the control system, the structural design of the main part of CNC machines also requires high precision, high stiffness, high resonant frequency, low inertia, low friction, and proper damping ratio. The basic components of Metal CNC machines mainly include bed, column and working table. Their basic function is to support, carry and maintain the relative position of each component. 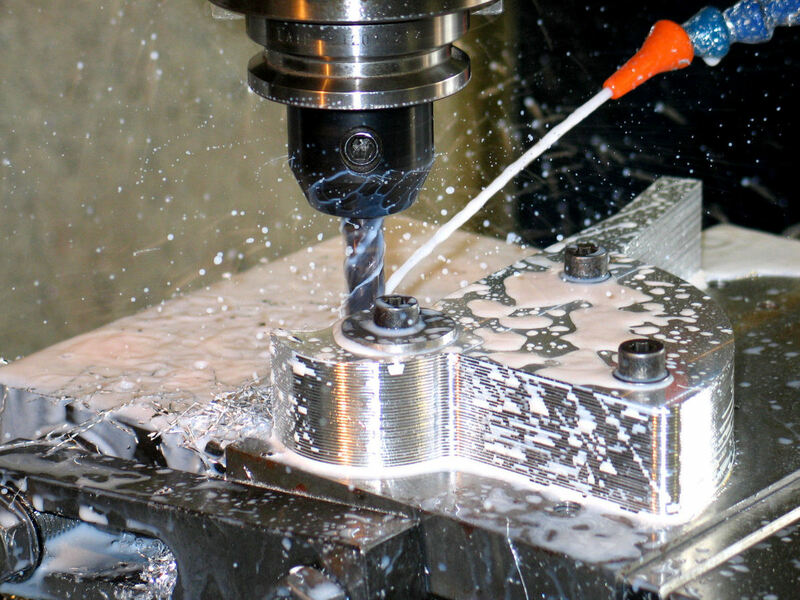 Ideally, the CNC machines should be able to do both rough machining and fine machining, so they must have abilities to withstand the maximum cutting force of the large knife during rough machining, and ensure the high precision under fine machining process. The main drive system achieves the cutting power required for a wide range of tools and workpieces. Meanwhile, it guarantees constant power output over the widest possible range of speeds. At the same time, in order to achieve the best cutting speed for CNC machines, the main drive system must achieve infinitely variable speeds over a wide range. Current Metal CNC machines use high-performance DC or AC infinitely variable speed regulating spindle motors, which has higher efficiency than the mechanical step-by-step transmission chain. First of all, the mechanical components of the machine must be rigid and strong to support the quickly moving parts. The spindle is usually the strongest part and is supported by large bearings. Then, the bed or worktable of the machine is supported on hardened steel “ways” which are usually protected by flexible guards. Cast iron or Meehanite used to be the material of choice for metal working machines. Today, most machines make liberal use of weldments of hot-rolled steel and wrought products such as stainless steel to reduce cost and allow fabrication of more intricate frame designs. Until recently, most machining centers were built to customer specifications by the machine tool builder. The actual manufacturing process proceeds as follows. Manufacturing the metal CNC machine. Image source. The base of the machine is either cast or welded together. It is then heat treated to remove casting or welding stresses. The base is fixtured into a large machining center, and the mounting areas for the ways are machined to specification. The ways are ground flat, bolted, and pinned to the base. The mechanisms that move the bed or spindle are called ballscrews. These change rotary motion of the drive motors into linear motion and consist of a screw shaft and support bearings. As the shaft turns, a bearing mount follows the spiral grooves in the shaft and produces a very accurate linear movement that moves either the worktable under the spindle, or the spindle carrier itself. These ballscrews are bolted to the base with the bearing mount bolted to the worktable or spindle carrier. The spindle is machined and ground, mounted to its drive motor, and then bolted to the movable spindle carrier. Each axis of motion has a separate ballscrew and set of ways in most machining centers. The computer is main part of a controller. It has a climate-controlled enclosure mounted on the side of the frame or in an operator’s console. It contains all of the operating memory, computer boards, power supplies, and other electronic circuitry to operate the machine. The front of the controller has a video screen that displays the program information, position, speeds and feeds, and other data required for the operator to monitor the machine’s performance. The assembled machine is test run for accuracy. Each machine has slight physical differences that are mathematically corrected in the computer operating system. These correction values are stored in a separate memory, and the machine checks these continuously. After testing, the finished machine is painted and prepared for shipment. That is the general manufacturing process of Metal CNC and we sincerely hope it’d be helpful. Don’t hesitate to leave your comment below if you have any questions.